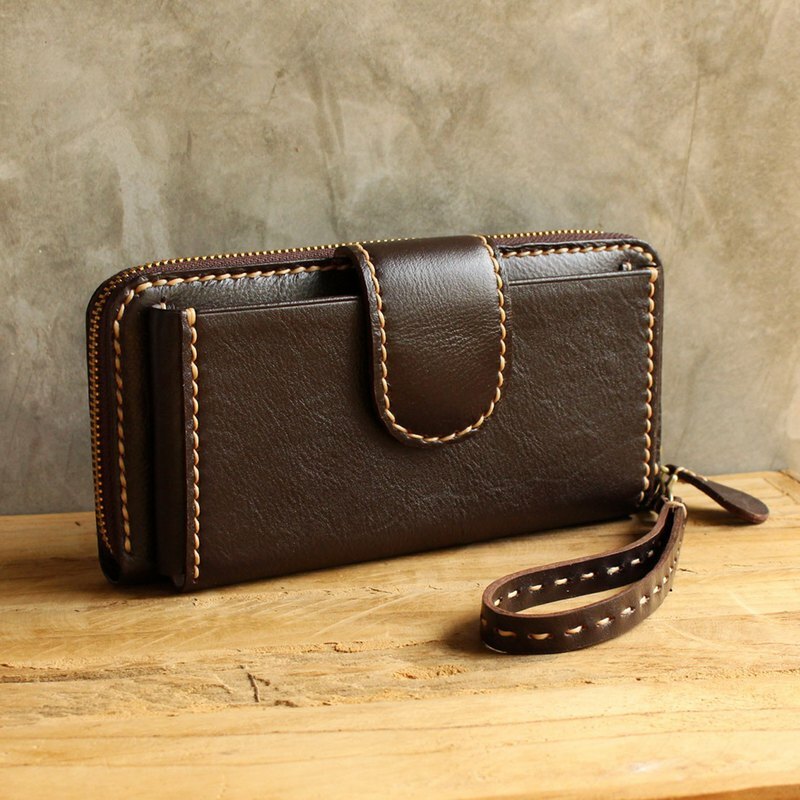 Handmade Wallet / Clutch with removable wrist strap & mobile pocket & has its own leather texture for each one. Leather Wallet / Leather Clutch / Wristlet - Delight Handmade with experienced craftsmanship & the leather has its own texture for each one. Sophisticated & very functional wallet.The wrist strap is removable so you can use this as a wristlet for a night out or remove the strap and keep it in your purse as a regular wallet. Interior features -- 1 magnet closure pocket for mobile phones 10 card/credit card slots 4 money/banknote slots 2 sections for tec. notes / receipts / coupons 1 zippered coin pocket Size : 9x19.5x3.5 cm. (HxWxD) (Front pocket : 8x17x1.2 cm.) Color : Dark Brown **Please allow for some variation in color as displayed on different devices and screens. Actual colors may vary. Olive Green : https://th.pinkoi.com/product/mdc29LdQ?category=1 Purple : https://th.pinkoi.com/product/Edwbam9i?category=1 Material : Genuine Cow Leather, gold color zipper, magnet closure Expected Delivery Date : For Taiwan , Hong Kong and Macau destination, your orders are estimated to arrive within 7-14 business days.